Second-year master’s degree candidates in the conflict transformation and restorative justice programs at Eastern Mennonite University’s Center for Justice and Peacebuilding (CJP) recently completed practicums engaging with peace education, historical memory, refugee worker burn-out and other topics. In August and September the following candidates presented about their recent practicum sites and research interests. As “Shalom Director” at Brethren Woods Camp and Retreat Center in Keezletown, Virginia, this summer, Hershey taught classes to campers about shalom, peace, conflict resolution and the history of the Brethren Church as a historic peace church. She also helped if a conflict arose between campers, counselors, or staff members. More than forty years after the end of the Spanish dictatorship in 1975, there are still controversial debates around concepts of justice, truth and memory related to the period from the beginning of the Spanish Civil War (1936-1939), the dictatorial regime that followed the war (1939-1975), and the transition of the country into a parliamentarian democracy. During this episode of the Spanish history, hundreds of thousands of people suffered from murder, execution, imprisonment, torture, prosecution, and enforced disappearance. How Spain dealt with the consequences of these crimes – categorized as crimes against humanity by the International Criminal Court’s Rome Statute of 1998 – is the starting point of the contentious debate still present in the political and social arena. This research-based project, done as part of a research fellowship with the International Center for Transitional Justice in New York, analyzed the impact of the transitional justice mechanisms that occurred in Spain from the end of the dictatorship to the present days in younger generations. It explored questions around justice, recognition, memorialization and reconciliation as alternatives to assure a more peaceful stability and coexistence in the country. These questions included the perspectives of experts in the field, as well as young adults born between 1990 and 2000. They reflected on the stories of their families during the civil war and the dictatorship, what they learned from them, and what their role can be on issues like historical memory, memorialization and assurance of non-repetition. The Colombia departments of Valle del Cauca and Cauca, both located within the Pacific and Andean regions of Colombia, have historically been heavily impacted by the armed conflict due to the various armed actors (legal and illegal) in the region as well as by the business of drug trafficking. Even though the peace agreement between the government and the FARC was signed and is slowly moving into implementation, there are many challenges that remain for the country to truly experience an end to armed conflict. The lessons from this context come from working with the political incidence branch of Edupaz, a peace education organization based off the city of Cali. Andrea worked with small church communities in urban and rural areas and with a conscientious objector collective in Cali, all of which are doing grassroots community work to build peace within their contexts. Her capstone covered the learnings and challenges from this experience as well as reflections on what it means to be a peacebuilder living in Colombia during this time. 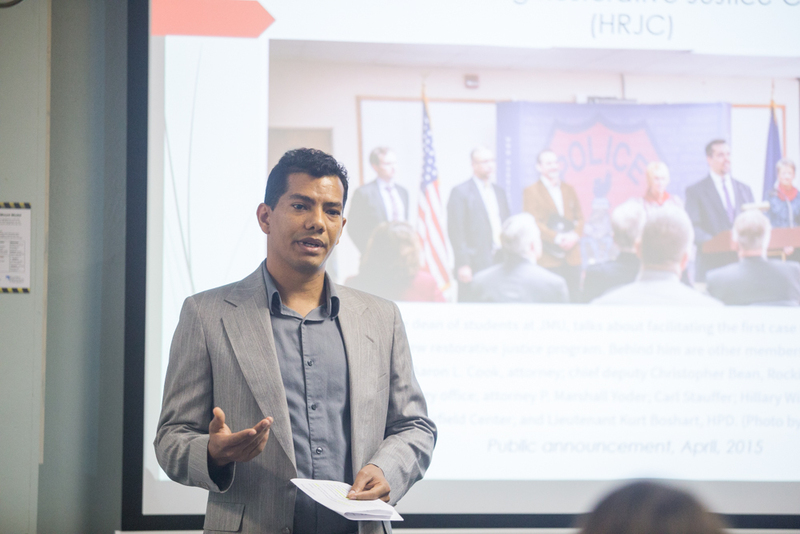 Boris’ practicum aimed to increase capacity and collaboration at the Harrisonburg (Virginia) Restorative Justice Coalition. One key goal was to accompany the organization in developing a strategic process that resulted in an action plan. A series of sessions using whole systems approach and public health tools for coalition-building affirmed the role of coalition stakeholders, established short-term objectives, and developed strategies for long-term sustainability of the coalition. Only a few of the multiple literature sources on the North Korean refugee issue focus on the people who work and relate to North Korean refugees. Organizations that provides various programs have reported issues of human resource management based on staff burning out and leaving their jobs. As a volunteer research consultant, Hannah investigated the programs and the experience of staff who work for North Korean refugee programs in South Korea, collecting data from organizations that provide direct and indirect forms of service for North Korean refugees. Those sources included existing networks with churches, social entrepreneurs and NGOs. East Atlanta, Georgia, is home to a resilient Mennonite congregation, an ambitious after-school nonprofit… and a flock of unruly chickens. Tyler spent his practicum among each of these communities, listening, ministering and networking (well…with the chickens it was more nest-working). While the focus of Tyler’s practicum was helping Berea Mennonite Church transition through a difficult time, his capstone incorporated lessons learned from his work with both East Atlanta Kids Club and Ecosystem Farm.